Being Mortal by Atul Gawande – A Must Read – for Everyone! It’s rare that I start a review with a glorious recommendation (or a complete rejection for that matter). But it’s also rare that I come across a book like Being Mortal. So let me say it straight out – this one is a must-read for everyone (yes, everyone)! Well unless you don’t know (or care about) someone who is in the later stages of their life, or you think that you possess the eternal fountain of youth and immortality, then by all means – ignore this book. Else – read it. It’s not the most pleasant read (okay, to be completely honest, it’s not a pleasant read at all), but trust me, it’s an important one. The author covers a lot of ground in this book, which makes it very hard to give a proper summary, without going on and on for eternity, so I will try to condense it as much as I can, but know this, there is no way any summary can do justice to the content of this book. Having said that, if I had to pick just one overarching theme, I would say this book is about death and dying – but on one’s own terms. Though there is so much more to it than that. In this book, the author explores the history of elder care in America, from home care, to poorhouses, to nursing homes, to assisted living. It’s also a calm critique on modern medicine. He doesn’t really place the blame anywhere in particular, it’s mostly an unbiased dissection of the reality of our times and the medical profession. 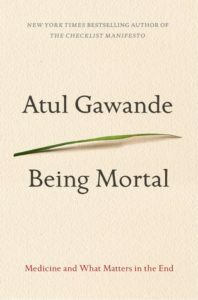 But more than anything else, Being Mortal is a distillation of what Mr. Gawande has learned – as a doctor, who has had considerable exposure to issues of death and dying, and also as a son, who has gone through losing his father to brain cancer. There were many things that spoke to me, when I read this book, but for the sake of brevity, I will only highlight the most important themes. A brilliant introduction to an enlightening book. One major theme in this book is the importance of planning. Now planning as a concept is not new to me at all – I thrive on plans, routines, and systems. But when it comes to planning for my mortality, that is something that I had never given any thought or attention to. Mostly because, let’s face it, planning for the fact that we are all going to die is not the most fun way to spend any given weekday, or even the weekend. But this book has made me rethink my stance on this. No, I still don’t think that it will be easy or comfortable, but I certainly realize it’s importance and inevitability now. The author has convinced me on the need to have these difficult conversations with our loved ones, before it is too late. To ask them (or ourselves, as the case may be) what they (or we) want, before we are in a crisis situation. Because I am sure that we can all agree on the fact that we don’t make the best choices for ourselves or others in the middle of a crisis. Now, on another note, did I really need to know that as I age my shrinking brain will rattle around in my skull? Ummm..no. Or for that matter did I truly need to know the frightening details of the downhill spiral of my teeth and bones, or health in general? Of-course not. And no, the author doesn’t really dwell on these things much, but I do. It triggers my over-active imagination, which only comes back with vivid varieties of gloom and doom scenarios. So you see, like I mentioned earlier, it is far from pleasant, in fact this is pretty grim stuff, but Gawande is graceful, at-least as graceful as he can be considering the subject matter on hand. The objective of medicine should not be to ensure health and survival; rather it should be about the quality of life and what it means to die with dignity, a sense of purpose, and most importantly, control over one’s life. It’s about being able to write the final chapter the way you want to, and to enable well-being in the sense one wishes to be alive. He is also a master at using stories of his cases to address disparities between our expectations and the reality of medical practice, and drawing on diverse research to advocate for needed changes. This is probably the most important book on mortality I’ve ever read. It is packed full of information and written in easily comprehensible language. So do yourself a great service, and read it soon. You will not regret it. It’s an essential guide to decision-making about end-of-life care, but also a more philosophical treatment of the question of what makes life worth living. When should we extend life, and when should we concentrate more on the quality of our remaining days than their quantity? I hope to face the end calmly and in my own way. I give this book five stars not because I loved reading it, but because it is what I would call a necessary read, and I mean necessary for everyone, young, old, medical professionals and laity alike. Why are you still reading this review? Go and get this book here on Amazon – Being Mortal NOW! That’s all from my end folks. I would love to hear from you guys! Have you read this book? Have you ever thought about talking to your loved ones about their priorities when it comes to their care during old age and health challenges? Until I read this book, it had never even occurred to me to have these conversations. I guess I was procrastinating it till a crisis comes along, which as I now know, is a terrible thing to do. What do you think? Do share. What an awesome summary Shantala. Dr. Gawande himself would be pleased. I’m a fan of Atul Gawande. He’s one of the few polymaths of our times, and has commanded tremendous respect in all the fields he has worked in. This book is already on my TBR list. My resolve to read it is even stronger after reading your review. Thank you so much, Vishal. Your feedback means a lot. I am so glad you liked the review, and I hope you are able to get to it soon. I am planning to check out The Checklist Manifesto by him. That’s a very good review Shantala, I understand exactly what you mean! Like you said, thinking about my brain rattling around in my skull isn’t pleasant at all, but being reminded of our mortality has its benefits, I guess. At least we’ll let the little things go, be less vain and focus on the important stuff! I will get the book. This is a topic that I need to accept and maybe this book will make me do that. Thank you for recommending, Shantala. I loved your comprehensive review, Shantala, as always. The topic does feel a bit morbid but I guess necessary. Let me put it on my list of reads. I read this book and thought it was super excellent. Even though I already agreed with Gawande that it’s crucial to have the end-of-life plan conversation, but I was still surprised by how much I learned from the book. I made a death plan right after! I, uh, should probably dig that out and see if it still applies. Reminds me of Paul kalanithi’s “When breath becomes Air”. First of all, congratulations on being able to review a book of this nature so comprehensively. I loved the parts about preparing for one’s or a loved one’s mortality. While I constantly find myself thinking about losing my loved ones, I cannot say I’m preparing myself for the inevitable. I’m adding this to my TBR list. Thank you for the reco! Yeah, it is definitely difficult to plan and prepare, but when you think about it, it is also vital. I am planning to handle it in small chunks. And review periodically. I know this is easier said than done, but frankly I’d rather deal with the unpleasantness than the alternative.